A few weeks ago I was on Pinterest and came across this amazing recipe for Rhubarb Panna Cotta Tart on Hummingbird High and thought, I have to give this a go! I love panna cotta and usually make the vanilla recipe from Nigellissima. It is gorgeous with some fruit and pistachio nuts chopped over it. 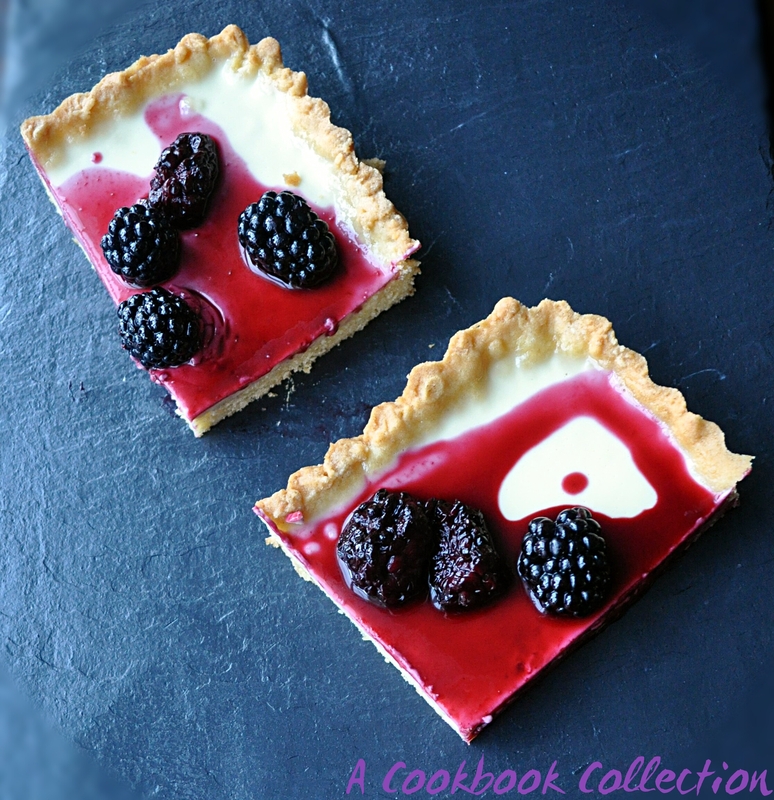 I used this basic recipe but increased the amount of gelatine as it needs a firmer set to hold for the tart. The shortcrust pastry is pulled from several recipes. Now, pastry is not my strong point. Please note that unlike other baking, pastries benefit from being kept cold so the butter and egg used should be chilled. I made this with the traditional method of using baking beans when blind baking the shell and removing after 20 minutes to brown the tart shell. It didn’t work, the pastry still rose when baking. I saw some great bakers online who said they never use weights so I decided to ditch the beans and go with Delia Smith’s method from Complete How to Cook. This is simply to keep an eye on the pastry and if it starts to rise, just flatten the pastry back into the tin. You can use any fruit and berries you want on top and you can also use frozen if it is easier. 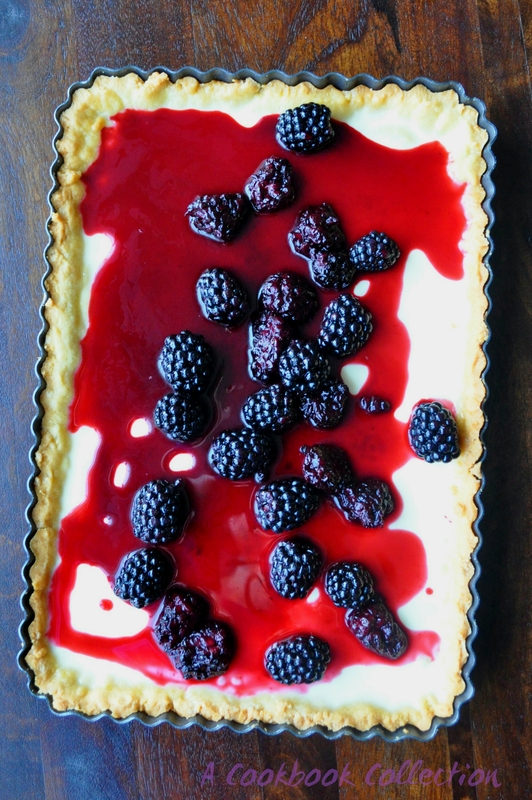 I used blackberries here just because they are in season and I like the sharpness of them against the creaminess of the tart. You can also use apple juice to cook the berries in instead of wine if you wish. This is best eaten on the day it is made as the pastry crust does go soft over time but honestly, it still tasted pretty good 2 days later. You can make the pastry shell the day before if it helps time-wise. When you are pouring the panna cotta mixture into the tart shell I would strongly recommend putting it into the fridge and then pouring in the mixture. I didn’t and when I was carrying it to the fridge to set I spilled some of the mixture which went under the pastry and softened it. See, I make these mistakes so you don’t have to! You’re welcome. Use a suitable gelatine substitute such as Dr. Oetker’s Vege-Gel if serving to vegetarians. Start by making your pastry. Place the flour, icing sugar, salt and butter in a food processor and whizz it up until the mixture resembles fine breadcrumbs. With the motor still running pour the egg yolk and water in and process until a dough forms. You can do it by hand and cut the butter in through the flour mixture with a knife to avoid over-handling and warming the dough. Then simply mix in the egg and water until a dough forms. Wrap the dough in clingfilm and rest in the fridge for 20 minutes. When it is rested, place the dough between 2 large sheets of parchment paper and roll until about 3mm thick. I like to roll between the paper as it is much cleaner, but you can do it on a lightly floured surface if you prefer. Use the dough to line a loose-bottomed tart tin measuring 12cm x 34cm. If the pastry tears when doing this, it is pretty tough so just patch it up with another piece. You should not need to grease the tin as there is so much butter in the dough. Put the lined tin back in the fridge for another 20 minutes. Prick the base of the tart with a fork to help stop the pastry from rising. Brush with the egg white to create a seal on the pastry and trim the edges with a small sharp knife. Preheat oven to 180c/160c fan/ gas mark 4. Place a heavy baking tray into the oven to heat with the oven. You will put your tart tin on this when baking which will help cook the bottom evenly. No soggy bottoms around here! Bake the tart case for about 25-30 minutes until it turns a golden brown. Check halfway through the cooking time and if the base has started to rise prick it again with a fork and press it back down flat. Allow your tart case to cool completely in the tin. Make the panna cotta by putting the cream, milk, caster sugar and vanilla into a large heavy saucepan and heating it through gently until the sugar is dissolved. When the mixture is heating put the gelatine leaves into a shallow dish and cover with cold water. Allow them to soften for about 5 minutes in the water. When the sugar has fully dissolved and the cream is hot, remove the saucepan from the heat. Take the softened gelatine leaves out of the water and squeeze out all the excess water from them. Add them to the cream and whisk it well to dissolve them fully. Put the tart, still in its case, into the fridge. Transfer the panna cotta mixture to a jug and give it a good whisk again before pouring it into the tart shell in the fridge. If you have some left over, pour it into a dariole mould and have an sneaky extra panna cotta for yourself. Allow it to set for at least 2 hours, longer if possible. Meanwhile, make your berry topping. Heat the white wine, sugar and 200g of the berries over a medium heat until the sugar has fully dissolved and the berries have softened. Add the remaining 100g of berries and just cook them through in the sauce so that they still keep their shape. Taste to see if you need to add more sugar. When ready to serve, ease your tart out of the tin. 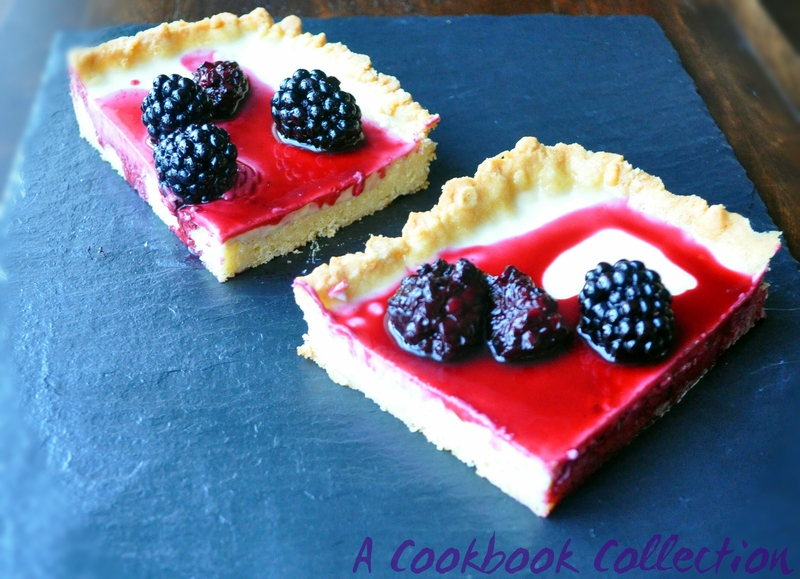 You can pour the berry sauce over the whole tart or cut the slices before topping each piece as desired – that is probably a less messy option! Like the creme brûlée, you can judge a restaurant by the panna cotta. Delicious. Yours looks top rate.